All other photos credit Adam Nonis except where otherwise noted. 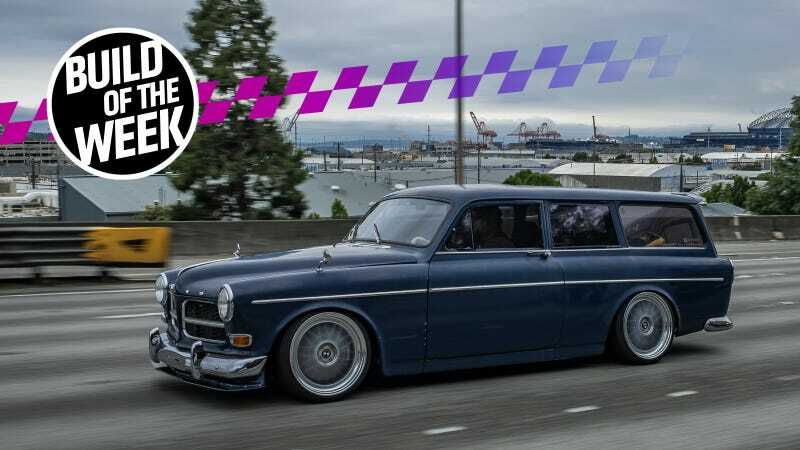 You know a project car is truly insane when swapping the body on another car was described as the “easy route” but that’s exactly what Adam Nonis did with his 1966 Volvo Amazon wagon. The Volvo was too rusty and needed too much work, so Nonis swapped the body onto a BMW E30—all in his own driveway in Seattle. The wagon in its original form. Nonis had started on his Amazon wagon project, stripping it down and converting it from a four-door to a two-door. The car was never completed and never ran. The amount of work left to do was just too overwhelming. I don’t have a garage at home so I’m at the mercy of a large number of things. Weather, family, house, etc. I decided that it couldn’t sit as a driveway ornament any more. Nonis’ solution—to find an already running car that had similar dimensions as his Volvo wagon to swap the entire Amazon body onto—was delightfully overkill. Well, not really, given his background in fabrication work. But, well, it’s still totally overkill given that he doesn’t have a garage to work out of in one of the most perpetually moist cities in the United States. Braces were temporarily added to maintain the wagon’s shape during the body swap. “The entire body swap was done in my driveway. In Seattle. Just about all the fabrication happened in my driveway. I would have to set up a ‘tent city’ when it rained. Cardboard ‘oven’ to cure paint and so on,” Nonis told Jalopnik via email. Nonis originally wanted to find a Volvo that would work to keep it in the family, but nothing quite lined up. He also wanted something that was rear-wheel-drive, with a manual transmission and ample aftermarket support. What he found was a BMW E30 convertible for sale on on Facebook that had already started to be parted out. Would you have ever guessed that a 1986 BMW 325i would be similar in size to an old 122 Amazon wagon? Me neither, but its measurements—both in wheelbase and from pinch weld to pinch weld—lined up well enough that this became the car. Best of all, what was left of the E30 still ran, making it the perfect base for the Volvo. What happened next was an astounding amount of fabrication work, and did we mention that this was all done out in Nonis’ driveway? He took some vacation time from his job to kick-start the project, and then went to town. Before any metal could be removed, the E30 was completely cleaned out, and temporary braces were added to keep the Amazon wagon’s shape. The wagon body was suspended by a lift, which is perhaps the best use of driveway space I’ve ever seen. Then he started the process of joining the two cars together. You can even watch Nonis’ livestreams of the body being lifted over the E30 chassis here and here, if you’re curious. While the BMW was almost the right size—almost is the key word there. The wheelbase was only about 3/8-1/2 inches too short, so Nonis used offset rear control arm bushings to push the wheels forward. Those are usually used to add caster to the E30, but in this case, it helped center the wheels in the Amazon body’s wheel wells. Nonis then built his own front coilovers using Corrado inserts in shortened housings to work with the custom front end. A set of eBay universal pillowball camber plates were used at the top. Custom structure used to lift the hood over the roof. Nonis told us that his biggest hang-up so far was actually creating hood hinges, as there wasn’t any room on either the Volvo or the BMW for them. So, he fabricated those, too, and adapted a Subaru hood latch to work with the car. The gas tank also presented a significant challenge, as the fuel filler neck was located on the other side of the car on the E30. So, Nonis fabricated a custom LED taillight that flips up and houses a new fuel filler neck. The E30 wiper assembly lives in the engine bay, but the Amazon assembly is inside the vehicle. Turns out the wiper motors are almost identical so I was able to swap the BMW motor onto the Volvo mechanism, then just fish the wiring into the car, hook it up and it all functions. Intermittent and all. The width of the Volvo bumper mounts is actually the same width as the “frame rails” on the E30. The swap left Nonis with a running, driving Amazon wagon that hardly looks like more than just a engine swap. After five years of it sitting with no progress, he was able to drive it just four months after putting the wagon body on top of the E30. He’s already started recovering the seats in red vinyl, but there’s much more to go from here. He modified a set of Volkswagen R32 front seats to work on the stock BMW seat mounts and fit in the car, as the mounts that came with the seats were too wide to fit. Nonis plans to keep the E30 dashboard for simplicity’s sake, but is having to modify it to work with the franken-car. A customized center console based on the stock E30 parts is also going in the middle—complete with E46 cupholders set into the top. He’s also slowly addressing the deferred maintenance on the car. “The E30 I bought to use as a donor was pretty neglected and stripped already so I’ve been slowly replacing just about every part on it,” Nonis said. Initially, the E30 came with an intermittent no-start issue and a slight miss, but those have since been remedied. A full-width radiator was swapped in using custom mounts after he noticed the original one had a small crack. The existing exhaust was a heavy hot mess of piping, so Nonis simply fabricated his own our of aluminum. Additionally, Nonis looked at some clever upgrades as well. He mocked up how he would fit individual throttle bodies from a GSXR600 onto the onto the E30 engine in CAD first, and then mocked it up in MDF for fitment’s sake. Custom grille plates were cut out of 0.125-inch aluminum plating for the Amazon body’s nose. A custom carbon fiber spoiler was added to the roof of the wagon to match a carbon fiber splitter up front. He wasn’t happy with the old plastic expansion tank in the engine bay, either, so he made his own out of aluminum. He even added what he called a “budget big brake kit” using 330mm rotors for a 2014 Jeep Cherokee paired with four-piston Wilwood calipers that were just $125 a piece from JEGS. Custom adapters were made to get it to work with the car and boom: bigger brakes acquired. Hell yeah, budget parts washer. While it may look like there’s a lot of waste from doing something like this—especially from the Volvo body donor—Nonis told SwedeSpeed that he’s doing his part to salvage and sell off any usable parts that were leftover. It’s worth visiting Nonis’ full build threads on R3vlimited or SwedeSpeed for this one, if for no other reason than the astonishing photos of all the fab work that went into this build and the absurd attention to detail Nonis has. Some parts were mocked up with MDF. An old oven was kept specifically for vacu-forming and powdercoating parts. Parts were cleaned in the dishwasher, because of course they were. Occasionally whole tools were fabricated to help keep the budget down. The lug nuts were even powdercoated gold to match the letters on the hood. It’s the ultimate bonkers budget build, and a true source of automotive inspiration that we should all aspire to emulate. You can also keep up with the car on Nonis’ Instagram here. New custom fuel filler neck, housed within a taillight. Mocking up individual throttle bodies using MDF. Custom muffler build in process. Nonis’ “hot work” station, getting ready to make a defroster duct. Customized valve cover for the BMW engine.